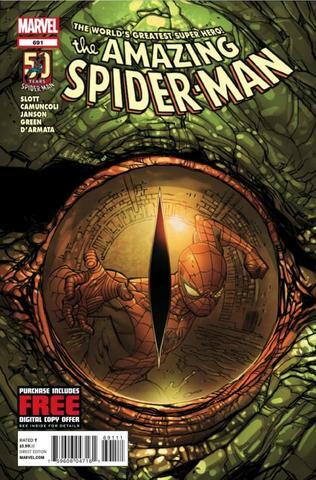 For an arc that seemed to start off as another mini-epic, the stakes were surprisingly lowered in this final issue, though I did appreciate some of the time writer Dan Slott spent on developing Curt Connors embodying more of the Lizard’s maliciousness than Spidey first suspected. And of course it’s very hard to complain when an issue of ASM ends with a visual of one of Spider-Man’s greatest villains-ever ready to make his comeback. But first, let’s talk Connors and the Lizard. Whereas I suspected at the end of ASM #690 that the focus of the arc’s final chapter would be on preventing total chaos from breaking out at Horizon Labs where the bulk of the staff had just been turned into Lizard creatures, I felt like Slott dropped the ball a bit here by making these creatures innately benign (and only subject to destruction when under the Lizard’s control). 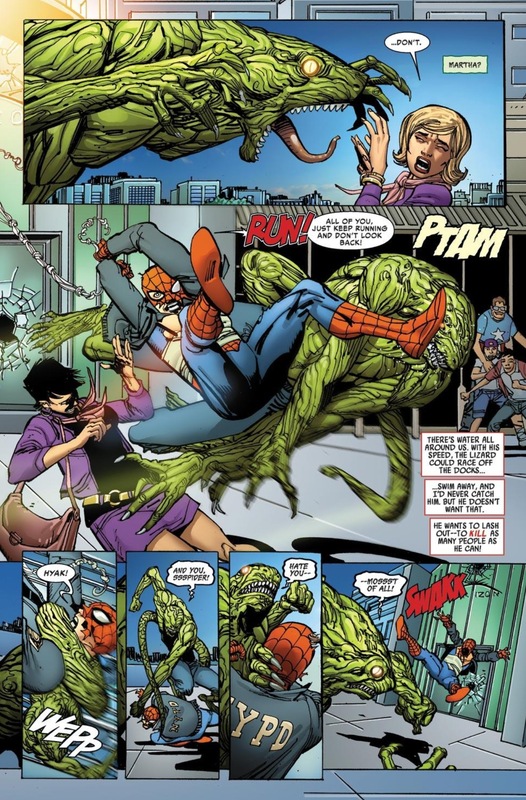 Of course, this plot development led to funny visuals (including two Lizard-creatures doing it like they do “on the Discovery Channel”), but the tension of the entire issue seemed to subside once Spider-Man managed to successfully navigate the Lizard away from Horizon. 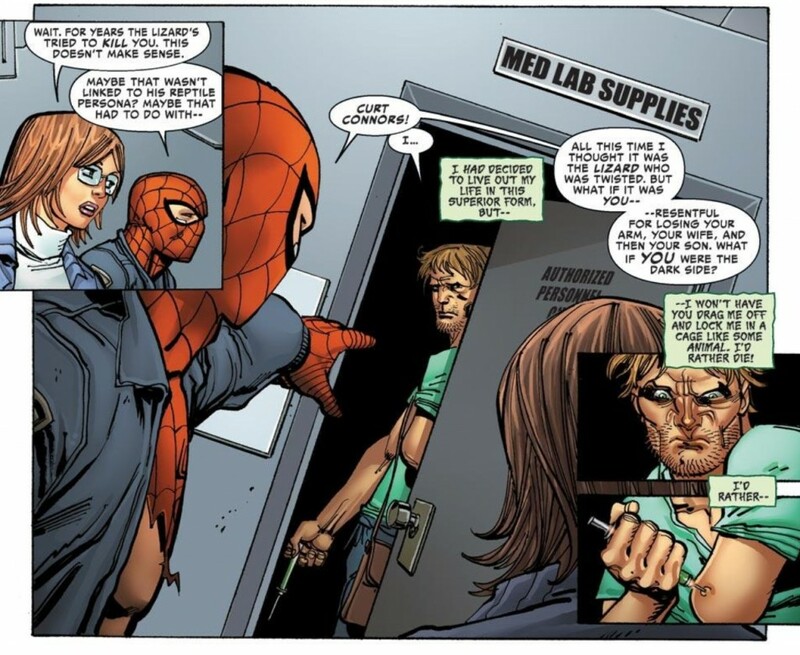 I appreciated that once order was restored, the lab staff had the wherewithal to note that this is like the umpteenth time they’ve been transformed into some kind of creature (and maybe instead of Slott making a joke about it, he should start exploring new ways for these people to be imperiled), but again, whereas Spider-Man saving New York City from millions of humans-turned-spiders felt epic and earned, in this issue, it all felt like an afterthought. Instead, the focus turned to Connors himself. Spider-Man raised a very interesting point about Connors animalistic side when he questioned why the Lizard is such an evil individual in his animal form. 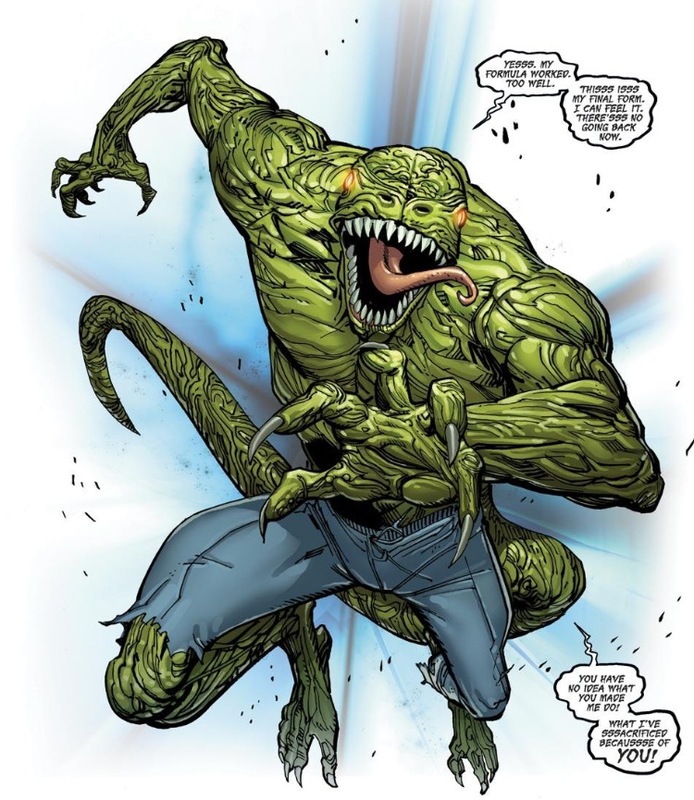 Of course, raising that question about Connors’ conscience and emotional stability (in human form) seems to reverse course of nearly 50 years of storytelling involving the Lizard, but it’s at the very least, a more unique spin on the character rather than what readers were being subjected to for the first three parts of this arc – which was essentially the Lizard/Connors completely turning his back on the character’s emotional duality. In this latest iteration, at least we can be lead to believe that Connors, in human form, may not be evil, but he’s certainly not epitome of good either. He’s complicated, like most human beings. Meanwhile, a less complicated individual makes his grand reappearance at the end of this issue and its Roderick Kingsley – thought to be murdered by Phil Ulrich, the new Hobogoblin some time ago – and it looks like he’s ready to reclaim his glider and pumpkin bombs. As someone who has found Ulrich’s Hobgoblin to be insufferable, here’s a case where I hope evil truly triumphs over evil – i.e. Kinglsey is back, takes care of Ulrich and his sonic scream, and then goes back to wreaking havoc on Spider-Man’s world again. Now, can Marvel just talk Roger Stern into doing either a 4-5 issue arc or mini-series about Kingsley’s Hobgoblin? Then I’d really be set. Sorry to bust your bubbel, but Christiphor Gage (bleh) is writing the Hobgoblin arc. Slott has been tying everything up in a nice little bow. He causually knocked tge Jackal away last issue. It’s sad, because all these things Slott’s bbeen building up are just going to waste. Well, hopefully Stern is able to write something Spider-related. Since the Amazing Spider-man comic ends with issue 700, does that mean that your chase is over once you get the six or so issues you are missing?